I'm not against labels in principle, these for example, are perfect. Good looking, modular and great for bulk-buying. 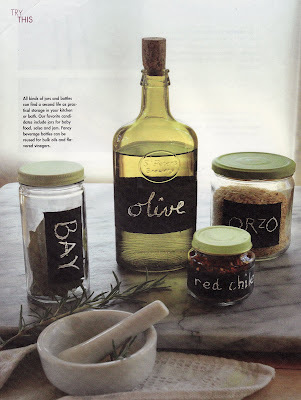 All you need is an empty bottle or jar, blackboard paint and chalk (found at any hardware store nowadays), and some tape (if you want clean edges); the perfect rainy day project. I just love this! You have an awesome eye for the unique. Thanks for sharing!